Police arrested two people at the "free speech" event in Berkeley, California — one for wearing a mask and another for carrying a knife. But the tensions that have descended on the campus — turning it into a focal point in the ongoing conflict between the white nationalist alt-right and the antifascist “Black Bloc” activists — were reduced mainly to screams and shouts as anti-Trump protesters gathered in small number. 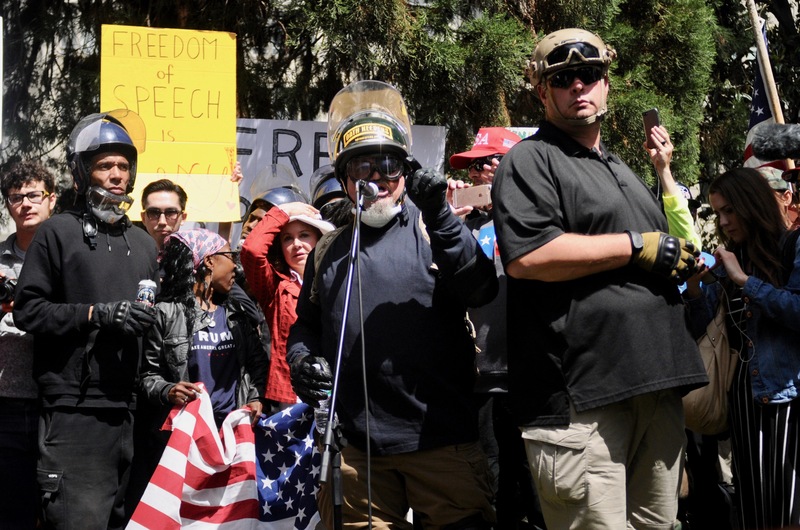 Those standing in support of President Trump and free speech, numbering in the hundreds, gathered at Martin Luther King Jr. Civic Center Park in downtown Berkeley, where they eagerly waited antifascist protesters that never came. Stewart Rhodes, the founder of the Oath Keepers, an antigovernment extremist organization comprised of current and former military and police personnel, brought members of his group to provide security. “This is ground zero in the defense of the Constitution and the most important part of it — the First Amendment. If you don’t have the right to free speech and assembly, you are not free,” Rhodes said, addressing the audience over a public announcement system. Rhodes, whose Oath Keepers are animated by a number of antigovernment conspiracy theories, told the audience that the Berkeley Police Department, whose heavily armed presence at the gathering was unavoidable, was working in coordination with Oath Keepers. The protest came as a response to the university cancelling a planned speech by conservative commentator Ann Coulter, who promised to come anyway. Two conservative student organizations, the Young America’s Foundation and the Berkeley College Republicans, filed a federal lawsuit on Monday. Citing a fear of violence, the groups later pulled their backing for Coulter, who ultimately cancelled her speech altogether. “I’m very sad about Berkeley’s cancellation, but my sadness is greater than that. It is a dark day for free speech in America,” Coulter said on Twitter. Lawrence Rosenthal, chair and lead researcher of the Berkeley Center for Right-Wing Studies, issued a written statement on the day’s events. Rosenthal warned people not to be cowed by the alt-right’s claims of censorship and noted that the university had two concerns to consider in cancelling Coulter's appearance — the unequivocal support of free speech and security.